The Easy Dose chemical injection system is used in irrigation and other pressurized water line applications. The EasyDose system combines modern technology with simplicity. The EasyDose pump is manufactured to withstand fertilizers, water treatment chemicals, acids and cleaning chemicals. 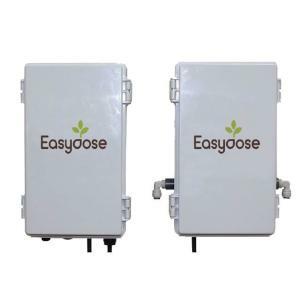 The software that comes with the EasyDose system allows for manual set-up or use the Smart Dosing software, making the unit proportional over a wide range of flows. The base system has both an electronic and a pump module that come enclosed in a weather resistant protective housing for outdoor installation. This versatile unit has a multitude of application options, such as: center pivot irrigation; solar powered systems; remote water treatment plants; greenhouses; hydroponics; drip irrigation or large field fertigation.